Once you are certain that you will be getting a divorce, you and spouse should both sit down with your children and inform them of your plans. You will need to be mindful of the children’s ages, maturity and temperament when you discuss the divorce. Often, children, regardless of their age, feel the need to shoulder the blame for their parents splitting up. So, when you speak with your children, make it clear that the divorce is not their fault. You will also need to remind them that although you have decided to end your marriage it does not mean that either of you will walk away from your responsibilities as a parent and that you will always love them and be a part of their lives. It is likely that your children will react to the news of their parents’ divorce with shock, sadness, frustration, anger or worry. You must be prepared for this. No matter how your children react, you should assure them that their feelings are understandable, but do not force them to talk about their feelings. Instead, let them know that when they are ready, you will be there to listen. You should be ready for them to ask who they will live with, whether they will need to move, will they change schools, if they will get to see their friends or any other questions relating to how their lives will change. They might not like the answers to some of these questions, but you must try to be as honest as you can be with them. As much as is possible when going through a divorce, you will need to be consistent and maintain a routine when it comes to your children. That means limiting sudden schedule changes and separations and ensuring that the children spend time with each of you even if it is inconvenient for you as parents. During the transition, you must look out for any behavioural changes that may suggest your children are having trouble coping. Pay attention to problems at school, regressive behaviours such as thumb sucking or bed-wetting or for emotional cues such as sudden or increased moodiness, anxiety or sadness. Divorces can be contentious. However, regardless of how difficult the situation is between you and your spouse, you must never display it in front of your children. So, you should never have heated discussions with your spouse or speak about them negatively with friends if your children are around. You should also never allow any issues you are having to disrupt the children’s routines nor should you use your disagreement as an excuse to exclude the other parent from their lives. You might think that hiring a lawyer will make the situation more combative, but the opposite is true. Hiring a family lawyer is actually a great way to avoid contention in a divorce. A divorce can be an emotional rollercoaster. When emotions are high, it can be easy for you to lose sight of the important matters and get caught up in back and forth arguments. A family will remain objective and will help you to finalize your divorce agreement in an amicable fashion that will serve your interests as well as your children’s interests. Do you need a Toronto family lawyer? 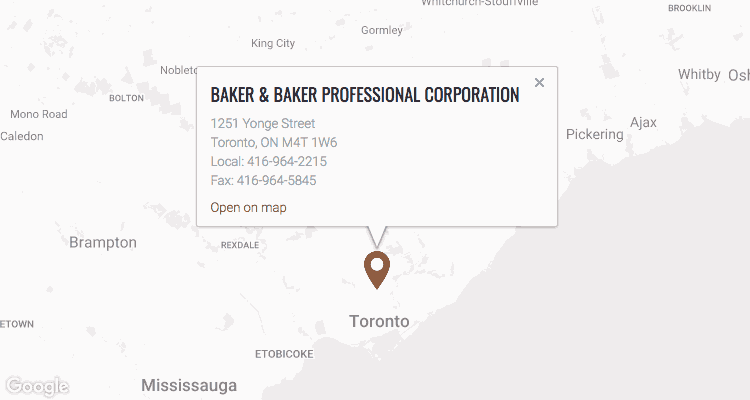 If you need a Toronto family lawyer to help you finalize your divorce in a way that will have minimal impact on the lives of your children, come see us at Baker and Baker Family Law. At Baker and Baker Family Law, we aim to get our clients through the divorce process as quickly and inexpensively as possible. We also encourage trying alternative dispute resolution such as mediation before taking your case to court. That way our family lawyer can help you to work out an agreement privately with a mediator, instead of having conditions imposed by a judge. So, what are you waiting for? Give us a call today to schedule a legal consultation with our Toronto family lawyer. Let us help you settle all the important matters in your divorce.